But, it was a thousand years ago too. We have been through so much. We've explored jungles among monkeys. We've walked hand in hand through rainbow valley. We've fallen asleep together on a beach beneath the stars. We have been snowed in, and loved every minute of it. We have felt deep, deep loss. We have experienced even deeper joy. We have shared our life with seven children. We have been a proud Naval family. We have been a heavy metal family. We have been a family of faith, and hope, and love. And we are growing still. Is that what I love most about you? we keep growing. And you help me grow. You are a man deep rooted in tradition. Yet, you roll with the changes, the seasons, the chapters. Even as we begin this bit of growing older, it all remains new. I am still madly in love with you. while excited about every moment of our future. The photo at the top of this post is my anniversary gift to Michael. But, I wanted to give him something absolutely heartfelt and precious. My young artistic friend, Annah Maria, lives in Hawaii, which is where Mike and I were married. I messaged her on facebook about a month prior to our anniversary to ask if she might be interested in helping me out with a romantic idea. 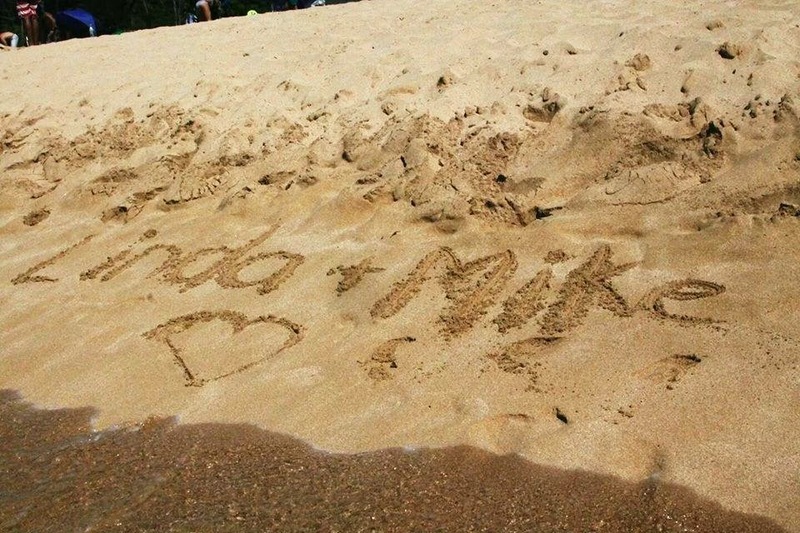 She agreed to carve our names in the sand of the beach in Hawaii, and send the photos to me. I framed the above photo, and gave it to Mike this morning. It brought tears to his eyes. No material gift could have done that. I am so appreciative of my young friend who made that moment possible. We may never return to Hawaii. But just for a few brief moments, our love returned to visit across the many miles, until the surf reclaimed the sand.